Pitch invaders are usually nowhere near as adorable as the one that interrupted Vardar’s Europa League clash with Rosenborg. A dog ran onto the field at the Philip II Stadium before rolling over for its belly to be rubbed when Vardar goalkeeper Filip Gacevski tried to pick him up. The Husky allowed Gacevski to give him some affection with a stroke, but as soon as the stewards came out, he sensed something was awry. When the men in fluorescent jackets approached, the dog scarpered out of arms reach. Finally, the security managed to persuade the canine pitch-invader off the turf and down one of the tunnels. The 33,000-seat stadium in Macedonia was a bit crowded, but there were some enthusiastic supporters setting off flares and the cheered the impostor as the strange scene unfolding. A fan filmed a video about the situation, cutting between the end of the smoky field and the halfway line where the dog had its day. Then the game resumed after the strange incident in the Group L final and maybe the appearance of the Husky will be seen as good luck. Vardar picked up the only point of the campaign as a Ytalo opener was canceled out by Nicklas Bendtner, penalty on the brink of halftime. The Skopje-based club finished behind Rosenborg, Real Sociedad, and Zenit St Petersburg, after a difficult first season in the competition. Check out the video of the funny Pitch Invader! 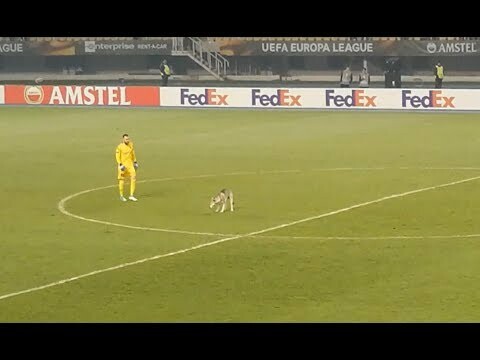 DoglopedixPitch invaders are usually nowhere near as adorable as the one that interrupted Vardar’s Europa League clash with Rosenborg.